Urban Simplicity: This is Mark. This is Mark. 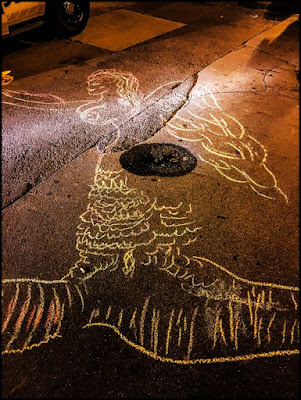 I saw him drawing in the street this evening as I was walking out to my favorite tavern. And when I say in the street I mean it quite literally as he was in the middle of the street. 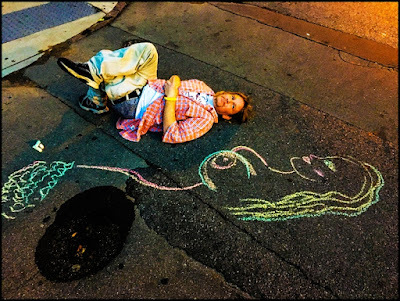 As I love free art I stopped to chat with him. He was drawing a mermaid, he told me. When I asked if I could take his photo he laid next to his drawing. He also told me he loved all sorts of artistic expression and that he wanted to help make Allentown (in Buffalo, NY) artistic again. As we were talking I couldn't help but notice the hospital band he was wearing on his wrist, as if he were just released. I asked him about it and he told me but I won't air his personal issues here. Then it occurred to me that I had met him before and had actually posted about him on this blog (read his story here). We had a nice chat. He told me he was homeless but never asked me for money, though when I offered some he readily accepted. I have to say it was really nice to chat with Mark this evening. We parted and I went and had a couple beers. 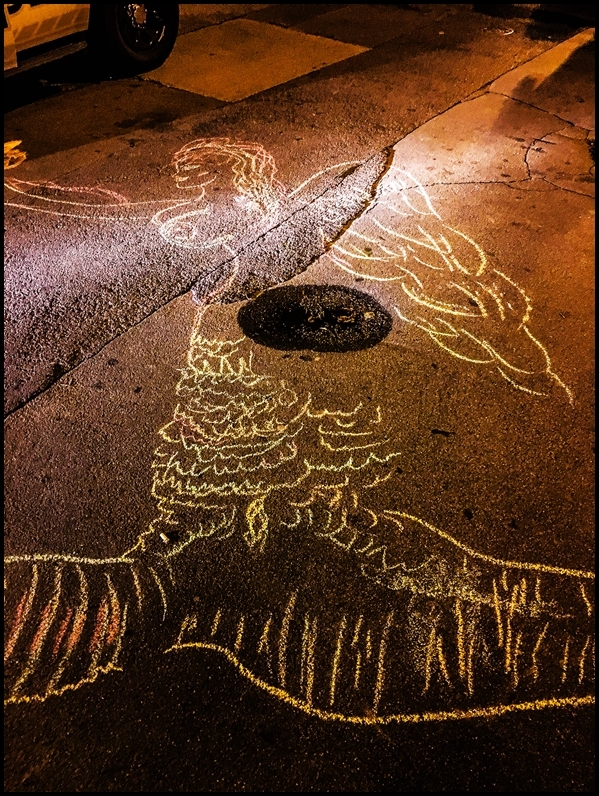 When I came out his mermaid was complete but Mark was down the street being interrogated by police officers (his drawing below is actually illuminated by the headlights of a police car). I don't know what the police were questioning him about, nor do I know his real story, but what I do know is that chatting with him tonight brightened my evening. I hope he finds his way. Read the previous post about him here.